For our last Hair Movie Night, we featured Good Hair, the documentary narrated by Chris Rock. Naturally, my challenge was to commit myself to learning about black hair. 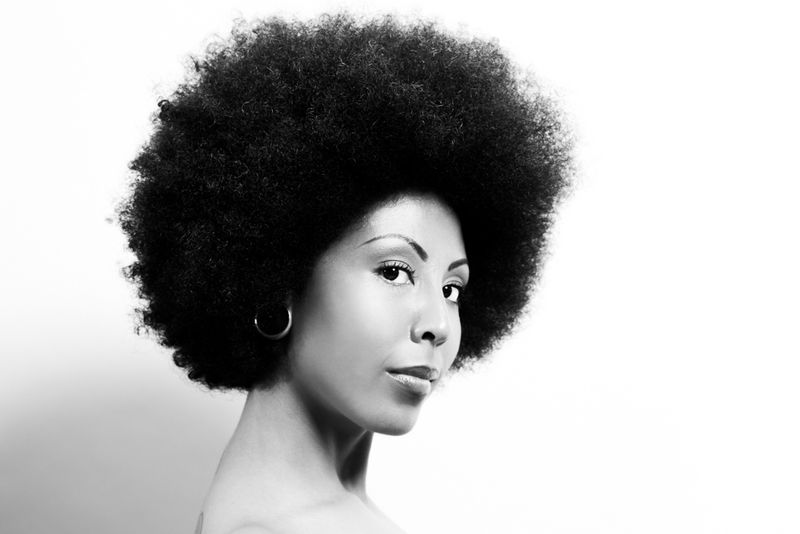 While doing research, I loved getting the chance to talk with people about black hair. After giving it some thought, I decided to share what I learned about black hair that makes it different, how I like to cut and shape afro hair, tips for afro sheen, and where I got inspiration for the shoot! 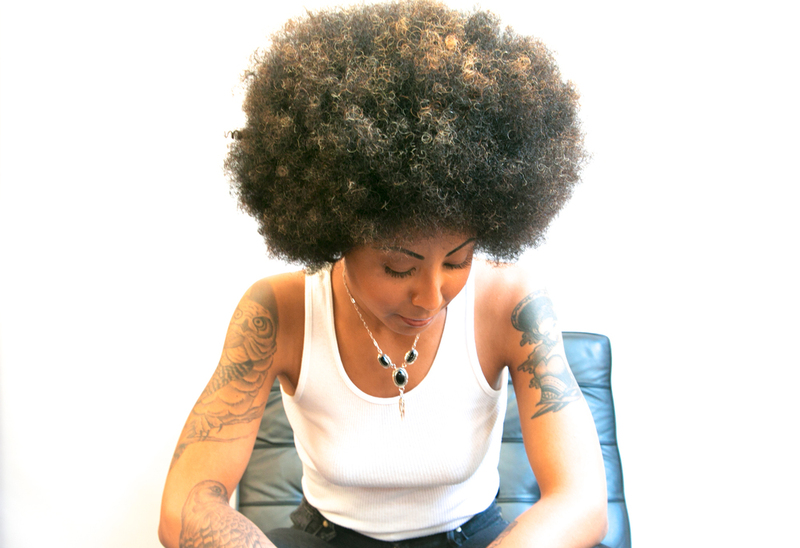 I'm loving pro-natural afro movement. Morphic’s very own resident photographer, Christina Campbell says about her own hair, “Its a rebellion against what young people’s moms were saying about straightening your hair with chemical relaxers.” She sees it as loving her culture by not assimilating to the most mainstream way to wear your hair. So, let's get technical for a second. What gives black hair its characteristics is that the cross section of the hair fiber itself is more of an elliptical/flattened shape than other hair types. This is why it takes on a helix shape. It also has extra surface area and therefore the texture is easier to damage. I approached our model Thea’s hair by first taking a large hair pick to it and starting at the bottom and brushed the hair out until it was at maximum expansion. As a long time hairdresser, I was able to feel the areas that were uneven and I started in the spots that needed the most length cut. I then went back and trimmed the whole thing around, from one side to the other, in a round shape, keeping it a little shorter at the nape to keep the hair off her shoulders and more in the air. For color, I mixed up some non-ammoniated Platinum and applied the solution on the foil and used the old-school “shoeshine” technique. I went around with freehand brush strokes and spread it evenly. The idea was to create a halo light effect even when its not backlit. I rinsed, shampooed, and conditioned and afterwards spread around the Bamboo Kendi Oil to nourish the hair. We finished with Rene Furterer Gloss Spray. It retained a really gorgeous sheen! 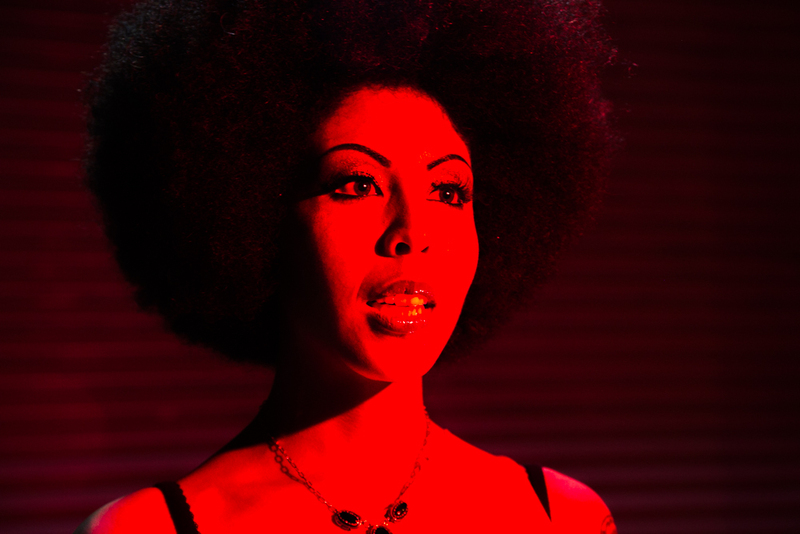 My inspiration, I looked to 70s trends and Pam Grier's great hair in the film Foxy Brown. Solange Knowles is also doing a great modern take on this right now. We're stoked for our next hair movie night! We'll be featuring The Artist! If you remember, this film charmed everyone back in 2012 with its silent film charm and classic love story. The finger wave is used heavily in the film, so we can't wait to wave ourselves into vintage perfection! We can't wait to watch this amazing film with you! See you April 7 @7:30pm! As featured in this week's SF Bay Guardian, this evening Morphic presents the cult classic horror film Bride of Frankenstein. This movie is packed with style! From beautiful costume design and impressive makeup to, of course, one of the most iconic film hairstyles of the century. Check out our hand-crafted Pinterest board for some spooky, gorgeous Bride of Frankenstein inspiration! This is an extra special night, because I will be accompanied by my guest speaker, author of The Bride Stripped Bare By Her Bachelors, and film aficionado, Francis Kohler. Kohler's book is a tale told in photographs about an unsuccessful reunion between Frankenstein's Monster and his iconic Bride-to-Be. We will be in full costumes, so we are encouraging you to join us in a little early Halloween attire for the occasion! ARE YOU READY FOR BARBARELLA? The 60's were a very special time for hair. We keep returning to it in our Hair Movie Night series because there is an infinite supply of inspiration to draw from. And what hairdresser can deny their love for the big, glamorous, foxy hair in Barbarella? I love this film because it's so outrageous and provocative, without being overly sexual. Barbarella might be a temptress, but she also maintains her doe-eyed innocence! For this shoot, we used our brand new Halo Couture pieces to give our model's hair that Victoria Secret effect. I originally set her hair in hot rollers, but went back over it with a curling iron to spruce up the waves a bit more. For color, I applied a gold and chestnut balayage highlight six weeks before the shoot. The day of the photo shoot, we gave her a fresh trim and did a L’Oreal Dia Light 9.03 toner to revive the shine and sparkle. The buzz is all about Gatsby. And why not? 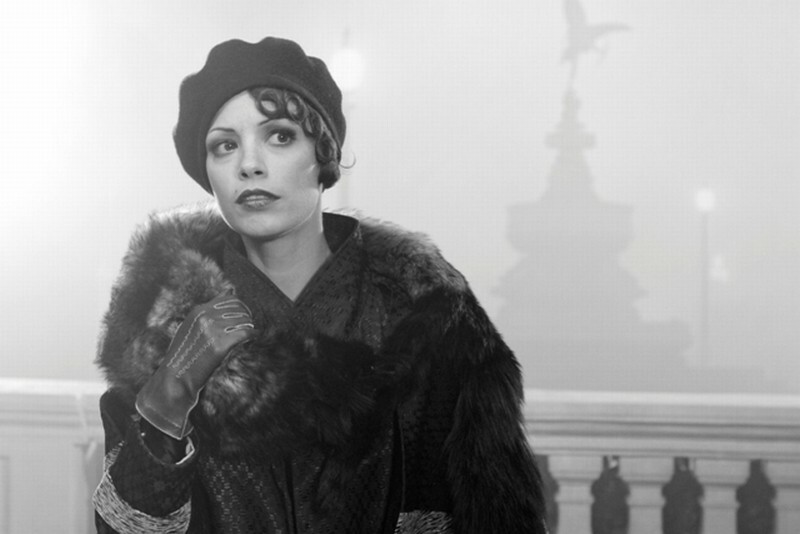 The past few years, Roaring 20's style has been beautifully on trend. 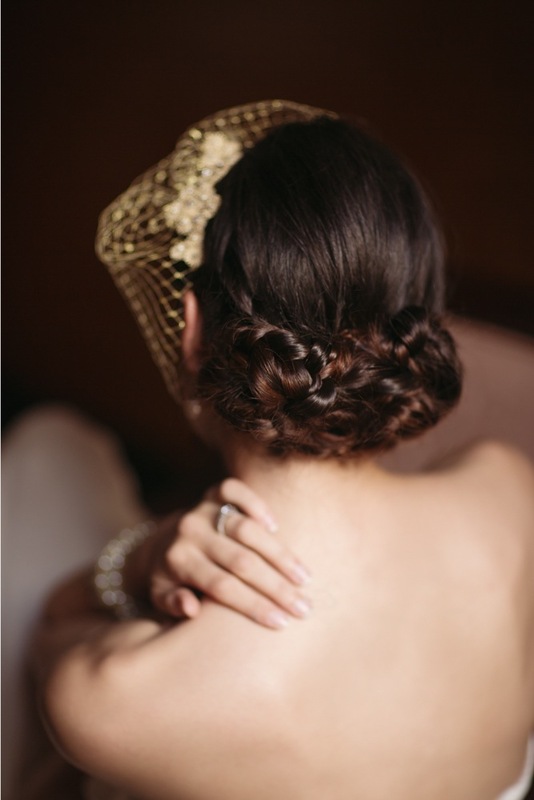 To celebrate the release of the film The Great Gatsby the nice folks over at Idojour asked us to come put our own braided twist on the iconic 20's style for their bridal ad campaign. We couldn't be happier with the final result.